Paul Ward, 42, who was sentenced to 10 years for wounding with intent. A man who stabbed his girlfriend repeatedly in the neck then tried to suffocate her with a pillow has been jailed for 10 years. Paul Ward’s girlfriend thought she was going to die during the vicious attack at their home. Fuelled by drink and drugs, Ward, 42, launched the frenzied attack on his partner using a kitchen knife to stab her to her head, neck and shoulders. When the woman tried to get up from the bed, Ward pinned her down and smothered her with a pillow. Sentencing Ward, Mrs Justice Cheema-Grubb, said: “She thought she was going to suffocate and die. “You shouted you didn’t give a f***, which I’m sure were your feelings at the time. Ward, from Morecambe, was charged with attempted murder but later pleaded guilty to wounding with intent. The court heard he had a troubled background and has developed a personality disorder which is exacerbated by the use of drugs. 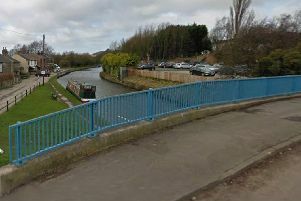 At the time of the attack at their home in Lancaster in August last year, Ward was on bail for racially aggravated ABH and harassment after he bit the arm of a security guard who detained his girlfriend when she was suspected of shoplifting. During the attack he launched a tirade of racial abuse at the security guard and later made racist and offensive comments to a police officer in the custody suite. Justice Cheema-Grubb said: “Who are you Paul Ward? “You are 42 years old. You had a dreadful start in life but you know as well as everyone else in this room knows that there comes a time when you have to put your origins and the way in which you were mistreated behind you and look to your future. “Your partner forgives you. She has been very gracious and wants to stay in a relationship with you. “You were the one who used a weapon, terrifying this innocent woman. The judge said Ward was a dangerous offender and sentenced him to 10 years and eight months with a custodial element of six years eight months and a further four years on licence.